“Tales” is a book of three long stories by the Kyrgyz writer Chingiz Aitmatov, all of which were published in the 1950s and early 1960s. The most famous of these is “Jamilya” which was Aitmatov’s first commercial success and ensured him worldwide fame. The others are “First Teacher” and “Farewell Gulsary”. I have had six copies on order from Amazon for a year now (I ordered them just after the first book club meeting) but it is long out of print and even the copy I have was obtained from a second hand booksite now defunct. It will absolutely be the selection for my turn…if I ever get copies for you all. “Tales” won the Lenin prize for literature in 1963, justly so in my opinion. While Aitmatov was a product of his times and culture, he did not limit himself to merely writing “party-approved” material — although he was a journalist for Pravda for some time — but evoked a sense of time and place and human interaction that was timeless. Admittedly, I see the landscape and people more clearly because I lived and moved in that part of the world for many years — indeed, my wife hails from it — but what makes Aitmatov special is that he was a universalist, and embodied great themes of love and sacrifice and life into his work, in a way that transcended state or ideology or time. It’s no surprise that while unknown in the west, he is revered in the former Soviet Union (both my wife and my mother have his complete works) and Eastern Europe. 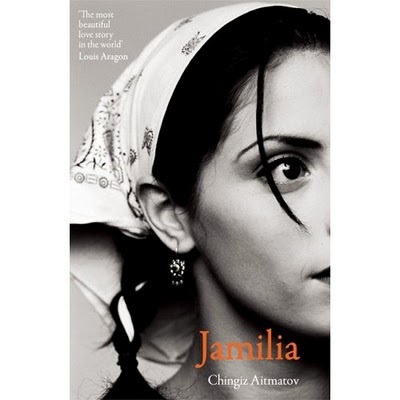 Set in the village life of Kyrgyzstan during WW2, “Jamilya” tells of a young boy called Seyit, who loves his headstrong, beautiful sister-in-law Jamilya and makes himself her protector (to the amusement of others), while his brother is off at the front. A remote cousin named Daniyar, wounded and half-crippled in battle, is discharged from the army and sent to the village, and, while initially seen as sullen and taciturn, is gradually shown to possess a heart and soul of great depth. More I’ll not say except to mention that Seyit’s own realization of his talent for art mesh into his understanding of the dynamic between Daniyar and Jamilya and his own making a choice between village traditions and the following of one’s own heart. Frankly, and you may laugh, this is quite simply one of the greatest love stories ever told, and I’ve never forgotten it. “First Teacher” (also called “Duishen”), like “Jamilya” is also about an older person looking back at the formative influences of childhood. In this case a girl at a small school remembers her own gradual enlightenment brought about by her teacher Duishen. On the surface this story toes the party line, referring often to the education and wisdom brought by the new communist teacher to an older culture steeped in tradition and not at all prepared for change; however, Aitmatov gradually pulls back the curtains to show that Duishen also wants to free the mind of the individual from the shackles of a rigourous and unbending tradition in a fashion that queerly echoes western thought, and in doing so, precipitates a conflict between the old and the new. My wife and I have often had long debates about this very theme, and even now, almost fifty years after publication, the story still has the power to move and be relevant. Chingiz Aitmatov, who died in 2008, was the most celebrated representative of Kyrgyzstan, a landlocked, mountainous nation of 5 million people in the heart of central Asia, which was a Soviet republic until 1991. A bilingual and bicultural writer, Aitmatov wrote his prose and plays in both his native Kyrgyz and in Russian, and was translated into more than 150 languages. Described as a “magical socialist-realist” in the Russian press, he was able to combine elements of Kyrgyz folk-tales and epics with formally traditional Russian realism. Aitmatov’s life was itself full of paradoxes of epic proportions: the son of a victim of the Stalinist purges, he became the most decorated of all Soviet writers. A beneficiary of the thaw, the cultural liberalisation which took place under Nikita Khrushchev, he became a world-famous author in the 1950s while still writing in Kyrgyz, gradually switching to Russian in the mid-1960s to became one of the most eloquent practitioners of the language. Aitmatov was deeply in love with his native land and lore, but he was also a Soviet patriot and a true internationalist. His father was a Kyrgyz and his mother a Tartar. In childhood, Aitmatov was familiar with ancient tribal customs and the nomadic life of his people, but it is to his mother he owed the exposure to Russian literature and culture which led to his harmonious assimilation of two cultures, the poetic synthesis of which became the secret of his art. When Aitmatov was just nine years old, his father Torekul, one of the first Kyrgyz communists and a regional party secretary, was arrested in 1937 and executed on a charge of “bourgeois nationalism”. A major theme in Aitmatov’s work is the inequality among men and women in traditional central Asian society. He also criticizes bias, the mullahs, lack of access to education for women, treatment of women as commodities, and polygamy. So do I – the English translations are almost impossible to find, so I have all his works in Russian as well. In fairness, my wife reads them more than I do.